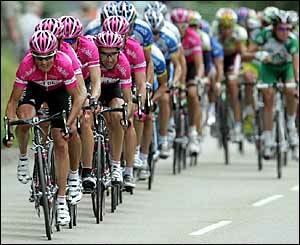 T-Mobile rode well in Stage 8; too bad about those uniforms. Somehow in the last entry I got my stages mixed up. The stage with the Côte de Dobel, Côte de Bad-Herrenalb, Côte de Nachtigal, Côte de Zimmerplatz, and Col de la Schlucht—that was Stage 8, not Stage 9. It’s probably my own fault, but I’m going to shift blame onto the official Tour de France Web site, which is the worst-organized, least-intuitive major site I’ve ever seen. It’s such a disaster that there’s not even a clear home page for you to bookmark. But I digress. The big climb at the end of Stage 8 had the desired effect, splintering the peloton and creating a tense, wide-open situation. The stage was won by a Dutch rider named Pieter Weening—yes, that’s right, Pieter Weening—who took off from the pack at the foot of the Col de la Schlucht and held on to beat Andreas Klöden literally by millimeters. But the real story in the stage was the relative strength shown by Klöden and the rest of T-Mobile, and the relative weakness shown by Lance Armstrong’s Team Discovery.